The experience could not have been better! 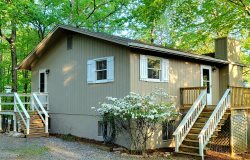 From the easy process involving Smith Mountain Lake Vacation Rentals, the beautiful home that we rented, and the lake. Amazing does not do the optics of the lake justice. Thank you for making it all so easy. You guys are the best. Kim and I had a great time at SML for our 30th wedding anniversary and we chose to spend it at the lake. We cannot wait to get back to relax in that setting again. Fun house - thank you! We played lots of pool and had fun fishing right off the dock. Great times with family! Wonderful house and dock! We have thoroughly enjoyed our week here. The cove is perfect. We look forward to coming back next year and the years to come. Thank you for opening your home to us. We love it! Thank you so much for sharing your lovely lake home with us! It was perfect in all aspects! We enjoyed relaxing on the deck while we ate our meals and took on the views. Our 13 yr old lab very much appreciated your hospitality and gentle sloping beach into the lake! It was our first visit to this beautiful lake and we will be back. Enjoyed your house. This is our third visit to SML and every time we come we want to move here. Our son chose a visit to SML with us as part of his graduation gift. Caught 4 catfish and a 5 lb big mouth bass off of your dock! Our golden retriever loved the dock, the beach and our boat! One week here is just a tease! "As thick grey fog spiraled up Smith Mountain, the lake mirrored the suns rising. It was yet another beautiful spring day at Smith Mountain Lake. My family and I have thoroughly enjoyed our visit in your charming home. We rested well, played hard at fishing and other water sports, enjoyed using the VCR for our favorite movies, and relaxed on one of the three/four solitary locations for a short nap or to read a good book. The kitchen, which was kept busy with the culinary talents of many cooks, was very well equipped with lots of casserole dishes, mixing bowls and loads of great utensils! We feasted on crepes with a creamed spinach sauce, fresh raspberries, blueberries in a sour cream sauce, fajitas, fried fish, fresh vegetables, homemade breads, salads, desserts - key lime pies, brownies with vanilla ice cream and thick fudge sauce. The list goes on. The boat dock afforded us time to feed the ducks and geese and the sunfish who really liked bits of bread! Fingers of lightening radiated the sky, gusts of wind gave voice to the chimes on the porch, and torrents of rain created a curtain of shimmering beauty. Our time here has been filled with anticipation of welcoming our children, their spouses and our grandchildren with the enjoyment of their visit and with sadness at saying good bye until another time when we will be together again. Thank you for sharing your home with us!!" Here for a week of relaxation, and thats exactly what we got! House was perfect for us, 2 busy boys and Grandma and Grandpa. Smith Mountain Lake is beautiful - perfect for swimming and boating. Thanks for the terrific stay! We had never been to Smith Mountain Lake before and we love it. It is very relaxing and fun. We jumped off the dock so many times and rented a boat at the state park. We went to Bridgewater Marina too. Thank you for a wonderful trip!